Why Choose "Drakes Bay Oysters"
We are a 4th generation Marin County farming family, completely committed to sustainable farming practices and local marketing of our oysters. At Drakes Bay Oyster Farm, we use environmentally friendly growing techniques, including an off-bottom, Japanese-inspired, “hanging culture” method. Used by less than 5% of U.S. oyster farmers, this method requires labor-intensive hand harvesting, resulting in our uniquely flavored, ultra-clean oysters. We grow our oysters in the pristine waters of Drakes Estero in Marin County—only a few miles from where you’re standing right now! And because we daily harvest, shuck and pack these award-winning oysters, they have no equal in freshness. We are the only shellfish farmer within the Point Reyes National Seashore, where a small, protected and undeveloped watershed surrounds us. Our farm contains California’s finest shellfish water quality—that’s why we are the only farm in California allowed to harvest year- round. The waters of Drakes Estero give our oysters the “taste of their place”! Drakes Bay Oyster Farm is home to California’s last operating oyster cannery, where we have been shucking and packing our oysters on-farm for over 70 years. 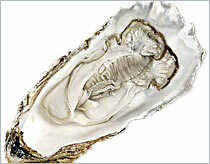 In choosing Drakes Bay oysters, you are helping to preserve a precious piece of California’s history.